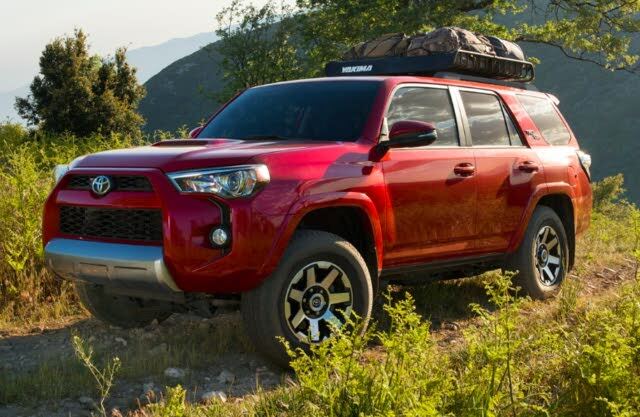 Have you driven a 2019 Toyota 4Runner? Displaying all 3 2019 Toyota 4Runner reviews. Im a real sucker for rugged design and the 4Runner has it in spades. The TRD Off-Road Premium combines that rugged utility with a family friendly attitude. The folding rear seats add to an already impressive cargo storage space and the sliding moonroof is perfect for those long spring/summertime family outings. The 4WD system includes a multi-terrain select feature and auto crawl control capability, so its ready to handle even the most challenging of road conditions! Some complain about the lack of a more innovative/updated infotainment system and relatively dated engine/drivetrain design, but it suits my needs and I am quite satisfied! Cargo Capacity Ranked 2014 Toyota FJ Cruiser 4WD worse. "The 4Runner probably has close to double the cargo capacity of the FJ Cruiser. That being said, the FJ was never designed as a weekend/holiday surplus store shopping vehicle." Would Buy Ranked 2014 Toyota FJ Cruiser 4WD worse. "I would buy the 4Runner over the FJ for one reason alone... rear seat access/sitting room. The suicide doors on the FJ are a cool-looking design feature, but they are 100% impractical for daily parking lot/garage use as well as if you have a family to transport to and from school/sports/etc. The 4Runner is far more capable as a family-focused vehicle in my opinion." MSRP: $35,110 Invoice:$32,302 Search Toyota dealers to find exactly the car you want. Comfy, great ground clearance, proven design and plenty of accessories available. Plenty of power and no fear of being stranded from bad parts or break downs. Best vehicle to own and drive. Two options I would have prefered as standard automatic headlights and built in garage door opener. Back Seats Ranked 2019 Lexus GX 460 4WD worse. "The unheated back seats on the Lexus takes a little getting use to in the cold winter weather. The cloth seats in the 4runner are very comfortable." Would Buy Ranked 2019 Lexus GX 460 4WD worse. "I am retired on a fixed income so the 4Runner SR5 Premium is affordable to me."